This morning, Friday, the members of the Congregation with the staff members had to wake up early. 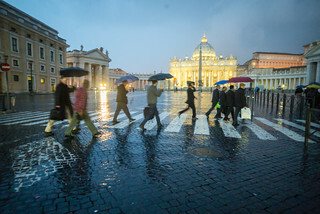 To begin the day, they all took the short trip from the General Curia to Saint Peter’s Square. 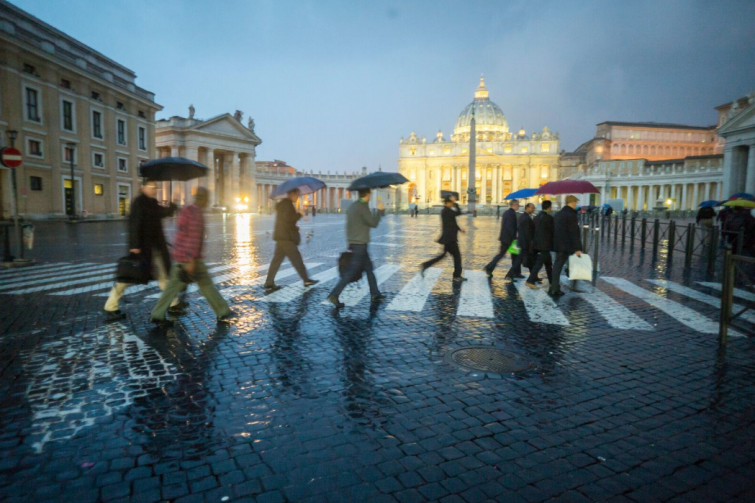 They walked under heavy rain: was it the blessings of heavens pouring on them? They went first through the Holy Door of the Year of Mercy. This jubilee year promulgated by Pope Francis opened on 8 December 2015 and will soon draw to a close, on 20 November 2016, the Feast of Christ the King. This tradition linked to jubilee years refers first of all to Jesus himself, who said, “Whoever enters through me will have Life” (John 10:9). The symbol of the door implies, too, the invitation to take a step forward and to leave something behind. 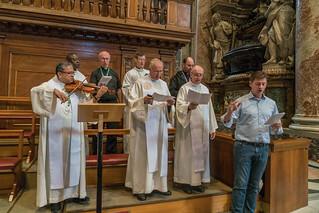 This process is meaningful at the moment when Jesuits prepare to elect a new general superior. 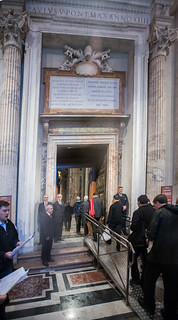 The electors then celebrated the Eucharist in the “Chapel of the Cathedra” or of the chair of Saint Peter. The window representing the light shed by the Holy Spirit fits perfectly the context of the General Congregation. This chapel is located directly behind the main altar of the Basilica. Fr. Bienvenido Nebres, the oldest member of the Congregation, was the main celebrant. In his short homily, the celebrant underlined the relations between Peter’s experience with Jesus and ours, as companions of Jesus. 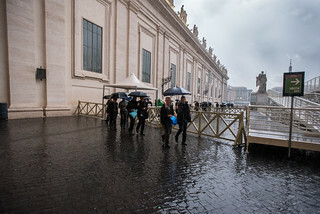 Making a reference to the place where we were, St. Peter’s Basilica, as well as the basilica of St. Peter in Gallicantu, in Jerusalem, he described the scenes of the denial of Saint Peter, of his profound grieving after his fault and of the breakfast on the shore of the lake, when Jesus, after his resurrection, invites his disciples to share a meal with him. What comes out of the three scenes – and can inspire us – is Jesus’ love for his disciples. To this love we are invited to respond, like Peter did: “Lord, you know everything, you know that I love you.” On the occasion of this first Friday of the month, we are invited to let the Love of the Heart of Jesus to touch our own hearts.